I don't remember them, but going by the Andersen in the background, there must have been some prefabs in Beckton Road itself. I will scan the other few tomorrow. re Andersen shelters, my grandma & granddad had one at the end of their garden in Leyton and I am sure that was at ground level too. I suppose having it partly underground would have been 'best practice' but people did what they could? 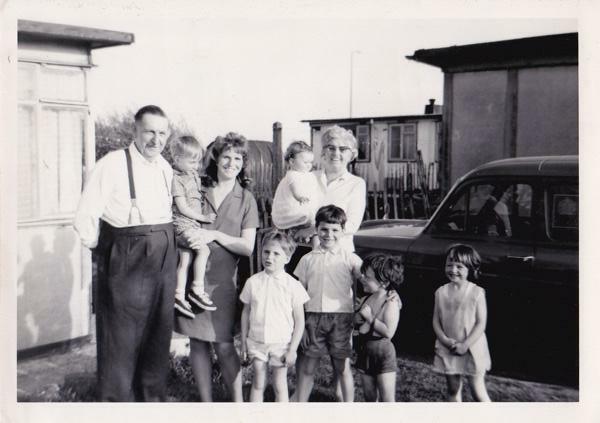 I think prefabs were built after the war so would not have needed a shelter,I would surmise the one in the background of Marks photo is a shed made from an Anderson shelter removed from somewhere else and brought to the Beckton road site which was built after 1945. Thanks Harry that makes sense We also had one in our garden. Re my dad's DER 'van' (he worked from the Barking Road shop) - this might explain why I thought it looked like a car in the photo. Apparently they used Morris 1300 Estate cars. Maybe someone could confirm if that is what is in the original photo? http://tinyurl.com/buk6w5n Info on DER vehicles. Hi mick bonnet not high enough to be a morris minor. It looks like a van google A35 van look at some pics. What i can see of your photo it looks like one of these. Smile at someone everyday life is too short to be miserable. Sorry forgot to say austin a35! As far as the Anderson shelter being above ground is concerned, my guess is that, since the photo was circa 1967, it was relocated above ground ti be used as a shed. After-all, few people still had them 'in the ground' 22 years after the war ended! I think when the Anderson shelters were supplied it was on instruction to fit them 4ft.underground and the 4ft.of earth dug out was to be put on top, this did cause some dampness and some were supplied with a small pump, but ours in Glasgow Road did not have a pump and was rather damp and stuffy but we was all very glad to run to it when the raids were heavy. During the blitz I never saw one of the those fitted above ground,but after the war many were dug up and converted Into sheds. The thing that brings back memories of the shelter is when I go into a building that is enclosed and get the smell the damp concrete. Great photo - I lived in Montgomery Gardens (No.25) from 1958 - 1965, you had to go down Eisenhower Drive, past Mallory Gardens on the left (I remember this road because my auntie used to live there) and a grocery shop and a further little shop kind of split in two, fruit & veg on the left side and SWEETS on the right! There was also an off licence on the other side of the road, then across a little mini roundabout and Montgomery Gardens were towards the end of the drive on the right hand side. I can't recall all the names of the roads, and I think there may have been another little mini roundabout, but Tedder and Paget Gardens come to mind (they were all named after Colonels or Generals?). The Community Centre was a quick walk out of the end of Montgomery Gardens. I have such good memories of living there; we had a big garden out the front and a massive garden at the back with a little wooden fence which was trodden down by us kids as a quick exit to the fields which were our playground. We moved to the estate from the bombed out debris of the docks and it was just like living in the country, building tents in the bushes and catching newts in the ditches. The banjo shaped road had a big green area in the middle, and as there were were few cars then. if we weren't in the fields, we could play out there or ride our bikes. I too went to Roman Road school. I can remember Mr Ayres, the head teacher, and Mr Paton who was my class teacher. My parents have a few photos of our prefab, I will try to fish them out to share with you all. I do remember that all the prefabs used to have a "coal shed" - which was a bunker like structure. Maybe that's what it is in the photo? That all sounds familiar to me except you have a much better memory than me. We must have moved there the same year you moved away - either '64 or '65 - I remember the bloomer loaves and definitely the sweet shop (something kids don't forget ), but I don't remember it being split in two. I can only remember Miss Mierus (not sure of spelling) and Miss Culoden (she married when I was there and became Mrs McCarthy) at Roman Road. I totally agree that it was like living in the country. There was always something to do - Not sure if the banjo you mentioned was the one we lived in which was off Beckton road, next to Eisenhower drive. I posted this photo of our shed on another thread. You can see our fence that backed onto the fields. I can't remember if there was a gap or if it had fallen down though it was a very basic fence. I am also new on here but I was very interested in your memories of the Prefabs. My best Friend Pat used to live over there with her brother Dennis Ward and her Mum and Dad. We used to go to the Community Centre Club to dance. We are both nearly 67 years young but have good memories of that time. We both went to Roman Road Junior Mixed and Infants School. One of our teachers was Mr Findlay Fraser and he was very strict. He also used to teach us to play chess and refereed schoolboy boxing on TV. His brother was Bill Fraser, the actor who played Snudge in The Army Game. We also had a teacher called Mr Jones who used to do Music and threw his arms around when conducting the choir. Mr Ayres was the Headmaster and after I had an accident with a cricket bat at aged 7, he used to pick me up every morning and take me to school and bring me home again, as I had a patch over my eye. My Mum wouldn't let me go on my own and I refused to stay off from school! We also had a teacher called Miss Brewer, who started a French Club after school and we performed Little Red Riding Hood to the school in French and I played the Grandmother. I'm pretty sure we had our jabs there too. Photo taken in Montgomery Gardens in the early 60's. 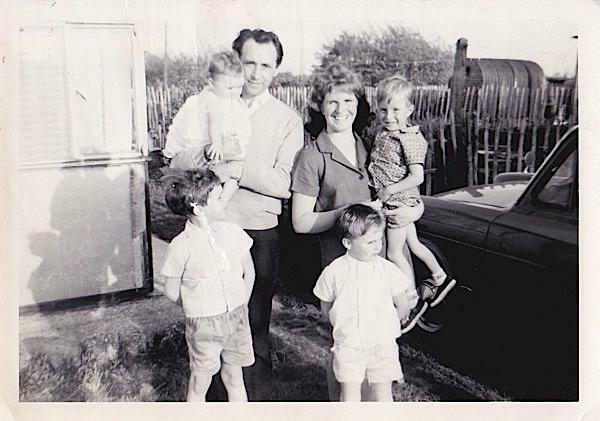 From l to r, me, my brother, two sisters (another baby sister joined our clan before we left the prefabs), and friend. I believe the little boy sitting on the grass with his dog was called Andrew. And another, taken around 1960 in the Community Centre in Eisenhower Drive. Some sort of party going on but can't remember the occasion. Our neighbour, Grace Redmond, used to be very involved in the Centre. My brother is pictured in the bottom left hand corner and you can just about see my hair and eyes behind him. A bit boring but a rare inside photo. You can just make out the fireplace!